This pair of JSP external knee pads wrap around your leg. They are British-designed with premium quality rubber with gel inserts - for your comfort. They are arguably the best knee pads on the market. Protect your knees against the rigours of tough, rough and hard surfaces. These knee pads give impact protection. They have adjustable knee straps and so are suitable for virtually any size legs. They are hard wearing & durable. Protect your knees, in comfort. Hard wearing durable knee pads. 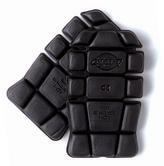 Robust gel rubber knee pads which have been designed to last. Offering increased comfort with elastic straps and hook and loop fastening. 3 Year Cleva® Warranty, (we enclose the Registration Card within the kneepad packaging). The Blackrock 4400100 EVA knee pads provide protection against impact on hard or rough surfaces, reducing wear and tear on the kneecaps. Lightweight and durable thanks to the EVA material, convenient velcro fasteners will keep these in place all-day long. Designed for use in construction and general trade these premium knee pads are excellent value for money and very durable. They come with an elevated turtleback shell for improved stability and movement. They are CE certified EN14404:2005 Safety Standards. Lightweight and comfortable making them ideal for all day wear. Flexible design that are easy to insert into trousers. 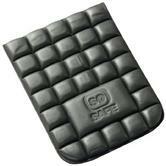 Co-Polymer foam padding that provides the user with superior knee protection. Very flexible and comfortable. The knee pads bend with the knee. The outer texture is ribbed for improved grip preventing any slips. Lightweight design for comfortable day to day protection. Single elastic strap holds the knee pads in place. Orbit Knee Pads are tough and durable, made to fit all workwear trouser and overall knee pad pockets. They provide you with extra protection when kneeling on hard or uneven surfaces. 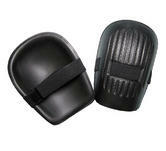 These knee pads fit all trousers and overalls, suitable for internal and external knee pockets. The Blackrock EVA foam knee pads are perfect for everyday use. They are suited to fit most knee pad trousers, offering cushioned protection against hard flooring when kneeling at work. Knee protectors from can be used with many work trousers. These top quality knee pads will offer long lasting comfort and protection whilst working. These knee pads are made from high quality materials, and give excellent protection against the stresses and strains of being on your knees for long periods of time. Suitable for all overalls and trousers with kneepad pockets, these 19mm tick foam kneepads will help to reduce stress on the knees by providing a protective layer between the knees and the floor. Protect your knees with the latest in EN 14404 certified knee protection (Level 1 Type 2). Exceptionally efficient and comfortable knee pads perfect for the patented Snickers Workwear KneeGuard™ positioning system. Provides superior protection for knees, lowering the levels of strain to the knee. Impact resistant, Adjustable knee straps making these kneepads suitable for all users. Hard wearing and durable, they give top quality protection every time. Long Elbow Pads on a Lycra sleeve with the padding covered by a grained cow leather abrasion patch for protection against abrasion. Memory foam padding conforms to the natural curves of the arm. Protection from Impact & Bruising. 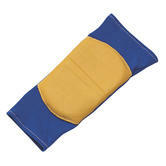 Protective knee pad inserts CE certified suitable for every knee pad pockets trousers. Ideal for tradesmen, plumbers or tilers. Ergonomic knee protector made using GelFoam material. Ideal kneepads when you want to look out for your knees. Recommended by many experts in construction industries. Type 3 kneeling is ergonomically designed to reduce stress caused from long periods of standing or kneeling. Cushioning abilities provide a soft, comfortable effect whilst maintaining a correct posture and allowing users to work for a longer time. It is incredibly useful to have around the workplace or house as provides a practical solution for knee protection. The point of strength of these knee pads is that they are so lightweight and easy to wear that you will not even know to have them on. The design wraps around your knee and are kept in place by two soft elastic straps. The hard outer shell adds protection against sharp objects and uneven surfaces. Made with high density polyurethane which is strong enough and thick enough to both protect your knee and cushion it at the same time. Black Himalayan ICONIC Knee Pads are designed to provide a comfortable cushion between your knees and the cold, hard floor at your work place. The Himalayan ICONIC Black Impact Knee Pads can be loaded either way with their either side loading system, Knee Pads are made from a robust 100% polyethylene material. So here's the rub: Knees aren't for life, unfortunately: Knees wear badly - due to knocks and bumps. So look after them: protect them from impact by wearing knee pads. Internal knee pads are very discrete, and most worktrousers come with knee pad pockets these days. (Knee pad pockets are a standard size thankfully). Integrated with kneepad trousers, specially designed knee pad pockets, a benefit - they never come loose or move out of position. 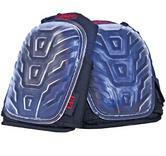 The IMPACTO knee pads tend to be most popular. External knee pads are especially handy for temporary use (and by being external they also protect your trousers/coverall from wearing through, when on your knees).